In the early 1930s, the sheriff of Wisconsin’s Iron County, Frank Erspamer, needed an automobile in which to patrol his jurisdiction. 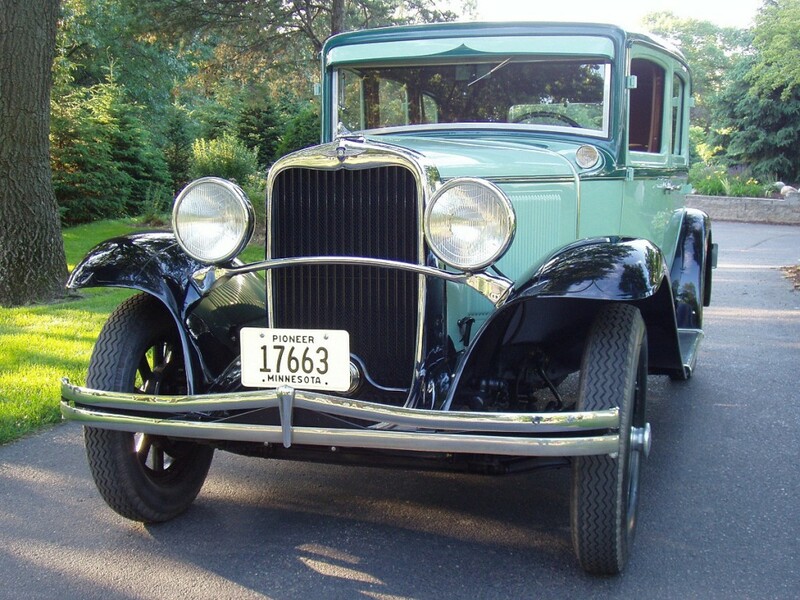 He lived in Hurley, Wis., but went to Bessemer, Mich., to purchase a 1931 Dodge four-door sedan. Erspamer paid $950 as he took delivery of a DH-6 model Dodge. 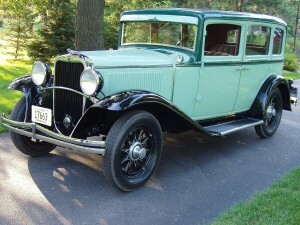 In 1931, Dodge gave customers a choice of wire wheels with adjustable spokes or wooden artillery wheels with elliptical spokes made of select hickory and balanced. There was no difference in price, so the sheriff selected the 3×19-inch wood wheels. The wheels were shod with 5.00×19-inch non-skid balloon tires. About three years passed with the Dodge faithfully serving Sheriff Erspamer. In April 1934, word spread through the regional law enforcement community that bank-robber John Dillinger, along with several armed gangster companions, were at the Little Bohemia Lodge in Manitowish Waters in northern Wisconsin. Dozens of federal, state and local lawmen raced to the resort. Sheriff Erspamer responded in his Dodge accompanied by three of his deputies. Dillinger managed to escape during the ensuing gun battle. Following his term as Sheriff, Erspamer passed the Dodge to his son, Bernie. The son had his father’s Dodge restored to like-new condition in 1980, which included reupholstering the interior and spraying fresh lacquer on the exterior. Around the fabric insert in the top a coat of dark forest green was applied. The lower portion of the car wears a coat of light mint green. Like most cars of that era, the fenders and apron above the running boards are painted black. The spare tire is outside at the rear of the car. The 2,820-pound Dodge is propelled by an in-line, six-cylinder, L-head, 211-cubic-inch engine that is rated at 68 horsepower. A total of 29 louvers on each side of the long engine hood help dissipate heat produced by the engine. A 17.5-inch, four-blade fan pulls air through the radiator to help control the heat in the 3.5-gallon cooling system. As with all Chrysler products, the Dodge was equipped with four-wheel hydraulic internal-expanding brakes. The front interior has a bench seat and a 17-inch diameter, three-spoke steering wheel. On the hub of the steering wheel are the horn and light controls, which include both straightaway and depressed headlight beams, cowl lights and taillight. Dodge literature points out that the stoplight is automatic. The ebony paneled dashboard is home to the choke and throttle controls. All the usual instruments are clustered near the 90-mph speedometer. The odometer can record 100,000 miles before rolling over to begin the second 100,000 miles, quite a feat in 1931. Sprouting from the floor, so as to be close to the right knee of the driver, is the handbrake lever and the gearshift lever to operate the three-speed manual transmission. Above the one-piece non-glare windshield is a fixed metal visor. The windshield, in a chrome-plated frame, is hinged so that it can be pushed open at the bottom to admit fresh air into the cabin. In front of the windshield is a pair of cowl ventilators. A single wiper keeps clear the driver’s side of the windshield. The Dodge is equipped with a single barrel up-draft carburetor, an air cleaner, as well as a flame arrestor. The gasoline tank has a capacity of 15.5 gallons. E-mail us your jpeg image, plus brief details and phone number. 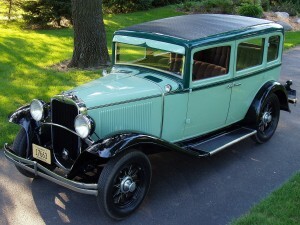 This entry was posted in Classic Cars of 1930s, Let's Restore this Old Car -- Classic Classics. Bookmark the permalink.